MUSCATINE, Iowa — This morning’s bike ride took nine cyclists on a 30.5-mile ride from Muscatine’s riverfront to Fruitland and back. It was a nice, but sort-of-windy morning for a ride. We rode for 2 1/2 hours and I averaged a not-very-speedy 12.2 mph on the bike pictured here. 1. When a friend organizes a ride and sends an email to a dozen people, including me, I need to read all of the replies when everyone hits Reply to All. 2. Short of that, I need to learn to say no once in awhile. 3. And since that’s not likely, I need to look a little harder the next time I can’t find the manual for my bike computer. An email was sent out Friday to organize the ride, which was to begin at 10 a.m. at the riverfront. I didn’t really read the emails because I was to work Saturday morning at my part-time job and didn’t figure I could be ready to ride at 10. As luck would have it, I finished early at work. By the time I got home, however, I had forgotten about the ride. 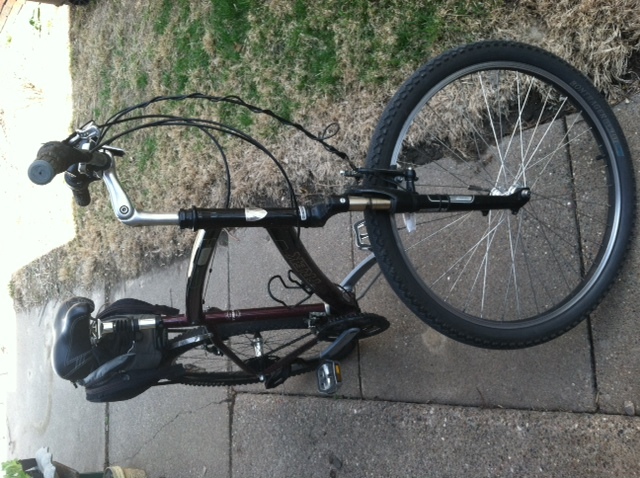 I jumped on my Trek Navigator, a leisure bike that is better suited for easy rides around town than it is for longer group rides. I headed for the coffee shop and then the bike shop, where Muscatine’s friendly bike mechanic said he could reset the computer since I’d forgotten how. Going to the bike shop, however, meant riding the bike trail on the riverfront, where, of course, my friends were gathering to ride. They hollered and asked if I was joining them. Here is where I should have said no. They all had their road bikes and were wearing bike shorts, jerseys and shoes that clipped into their pedals. Me? No special shoes or pedals. Cargo shorts. A T-shirt. I hadn’t even brought along a water bottle. But I went anyway. And I had a good time. I may have even stumbled on a good training trick: Ride on that heavier and slower bike with people who are fitter than I am in the first place and are riding faster bikes. For the most part, I kept up and I know I worked harder than I would have if I had been riding my road bike. According to the calorie-counting app on my phone, I burned 2,500 calories. If I can walk in the morning when I get up, I may have to bring the Navigator to more group rides in the future. My thinking is it would make me a little faster when I do break out the road bike. And who wouldn’t want that? After all, RAGBRAI is only 125 days away. so glad you went along – it was a great morning for a group ride!! Nice afternoon for a ride here. Got the kids out and did almost 9 miles on trail on the west side of West Lake Okoboji, which is a long way when also toting along a first and fourth grader. The second half of that was brutal into a 25 MPH south wind. Working our way up to the 14 mile ride around Big Spirit in June as a family. We won’t set any speed records, but I think it’s a good goal. Thanks for teaching me to cycle when I was in Muscatine. Not sure I ever would have if you hadn’t been the instructor. Thank you. 30 miles is pretty typical for the people I ride with, but it might still be a little early in the year to ride that far. In a good summer, I get to ride at least 100 miles a week — 3,000 to 4,000 miles from about now into early November. Don’t beat yourself up over the average. I rode the same distance this morning and averaged 13.3 on carbon. I’d say 12.2 on the Clydesdale is respectable. Well, averaged 14.3 today on 35-mile ride on my road bike. We were slowed down a little by the wind and the hill going into Grandview.